This year's biggest tragicomic teen movie is about friendship and how a 'lost' boy finds his way to loving someone selflessly. 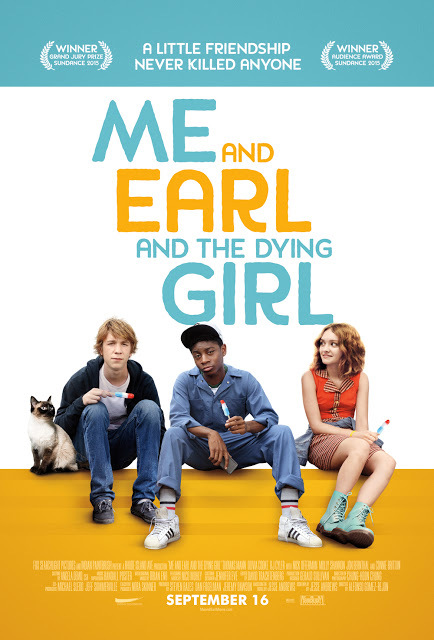 "Me and Earl and the Dying Girl" is yet another cancer-themed movie (the other one would be "The Fault in Our Stars") but with the heart and soul of a teen spirit. If you have reached this point, beware... SPOILERS might be written below. "Me and Earl and the Dying Girl" is not like any cancer-themed teen-adult movie. While other movies of the same genre focuses on the braveness of the cancer patient to fight the disease, or perhaps its main story is centered on the love story on how a cancer patient finds love unconditionally despite his/her sickness/condition, this movie from Fox Searchlight and Indian Paintbrush Productions has another story to tell. I like how a typical teenager-loser story we usually see in teen movies with the likes such as the "American Pie" franchise, "Loser", and one of my favorites, the "Not Another Teen Movie" was infused with this kind of cancer-themed movie genre. The author of the thought-provoking novel of the same title, Jesse Andrews must have gotten some inspirations to his high school life because of some instances and situations that I'm sure everyone of us can relate to --- teen dreams and aspirations, friendship, friendship over, Junior-Senior Prom, awkward moments, and funny and crazy antics with friends among other things. But of course, not all teenage life are full of happy memories. Sometimes, someone has to leave and leaves a mark behind. I guess the usual plot becomes suddenly an important twist to the main protagonist's dilemma. However, I guess the turning point of the movie "Me and Earl and the Dying Girl" is how Greg (played by Thomas Mann) had a realization towards the near-end of the film, which perhaps changed him as a better person (which I only speculate that). There are some things that can make us realize its importance when that thing or person is already gone. The "teen spirit" in "Me and Earl and the Dying Girl" has just right amount of high school-ness. The portrayal of a high schooler did not feel like it was put there intentionally. As a matter of fact, the movie is smooth-flowing. Although it felt like I can see some traces of "500 Days of Summer" here, with all due respect, "Me and Earl and the Dying Girl" is something that can make you laugh, smile, think, sad, smile, laugh again, and then finally fulfilled and satisfied with the film not because the dying girl died (shhhheesshh... she has leukemia! ), but because you know you have watched a good movie! If you are looking for a feel-good movie over this weekend, well, think again. "Me and Earl and the Dying Girl" is NOT a feel good movie! I have to warn you on that. But it is a good film in terms of story, movie technicalities, actors and actresses who played for their respective roles, and the scenes, comedic timing, and drama are just right and flawlessly delivered. In the end, we give "Me and Earl and the Dying Girl" an 8 out 10 stars! Below is the official movie trailer for "Me and Earl and the Dying Girl" now showing in movie theaters!